Recently a fabulous thing came in my mail ,I was planning to review it but due to lack of time it was impossible.I am a fan of the brand Makeup Revolution London.Their products are absolutely alluring.Today I am writing about the eye shadow palette that includes glam-up shimmers, subtle to bold smokey shades as well as not so loud nudes .So this festive season I guess this palette woud be a real good thing .This is a fabulous eye shadow from Makeup Revolution’s Redemption Palette’s Iconic Range . 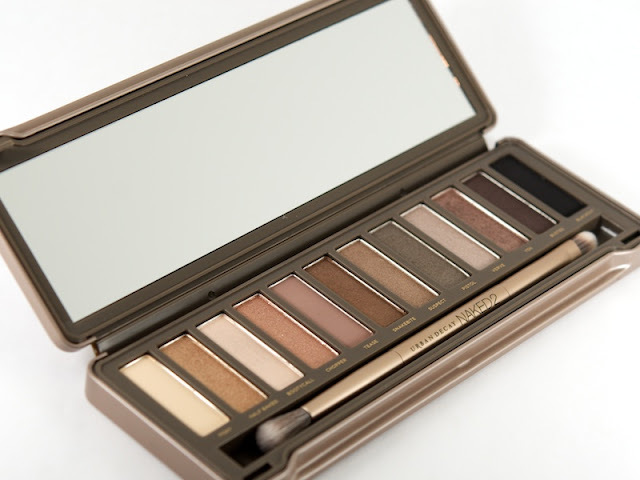 This particular Palette is named “Iconic 2” .If you are familiar with Urban Decay’s Naked Palette you can find that this one is completely Naked 2’s Dupe. The Palette’s packaging looks classy ,neat and sophisticated but very much familiar drugstore eye shadow packaging. The frame is black in colour and the rest is transparent plastic . I wish it had mirror but one good thing is that the gorgeous shades can be seen through it. The back side shows some details of the product.Opening it is simple, it has a flip mechanism that shuts with a click. The palette comes with a two sided brush applicator which is fabulous. I like the packaging but not 100% impressed with it .Mine had slight crack on the lid.So I am not rating it as much a travel friendly stuff. My imperfect lid ridicule was vanished while swatching .It is insanely pigmented and I am impressed with the pigmentation it provides. Lasts pretty much .Infact lasts longer hours than I expected it to. My eyelids are oily and brow zones sweats a bit .For there was neither any fall out and for experimenting it was used without primer .Honestly it faded negligibly and lasted till I used makeup remover. This product can also be bought directly from Makeup Revolution India's Instagram Page where price enquiry and oder placing procedure is answered and attend through whatsapp number which is given with picture description along with the photo of each product. 1.It’s a matte skin-coloured shade.It is much on beige side.Its is not at all chalky.It is ideal for brow. 2. The next is Shimmery golden colour which is not much “look at me” type and blends awesomely. 3. The third shade is the shimmery version of shade number 1 and looks vey classy. 4.Shade 4 is very much similar to shade number 2, its is more bronzed . Almost looks like rose gold or shiny copper colour. 5. Now comes the dull brown colour, which gravitates towards grey and had purplish under tone. It is matte and is pigmented, but doesn’t show up on all skin tones well.I find it pretty much essential to achieve suble smokey look. 6. The 6th shade is a fabulous Bronze Brown with a satin/metallic finish ,which is insanely pigmented only a tiny amount is needed to achieve a look.But one con about this is I felt it give a negligible fallout. 8.Shade 8 is a very nice shimmery taupe colour,which I am quite impressed with. 9. Shade 9 is s silver-gold unique shade shimmer colour. This festive season for evening or night even specially with party glam look or festive ethnic wear it is ideal for defining the brow bone. 10. Shade 10 is one of a proper rose gold colour.It is a shimmery shade perfect for festive season and bridal makeup as well. 11. I find shade 11 is very close to shade number 8, it is adorned with lovely brown. 12.Shade 12 is an intense black shade for an bold smokey eye look. 12 fabulus shade in a single palette,Pearls-shimmers-Mattes-Bolds all in 1 palette. Incredible staying power even without primer. Available mostly online in most of the cities. Yes i am .All those girls who are looking for smokey to subtle smokey, festive shimmers and daily wear mattes in a single palette this one is definitely for you. I would love to buy the unicorn mermaid palette from this range. Alluring shades i wish it was lil less pricey! This palette is kind of a dupe of naked 2 . Most shades seem to be more pigmented .Can you unbiastly clarify the fallout issue? Thank You for clarifying .The daily use shades that you mentioned does it work for all complections ?